A big shout out to the co-curators Icon Michael Roberson Maasai Milan and Twysted Miyake Mugler! of the Black Liberation Ball that was apart of the first Journey to Black Liberation Symposium that Brandon Hay of Black Daddies Club curated on February 9th and 10th, 2018 at the Harbourfront Centre, in Toronto, Canada. Thank you to the Harbourfront Centre for partnering with Black Daddies Club to make this historical event possible in Canada. Many thanks to the community partners and sponsors for making this event possible. The Black Daddies Club (BDC) and Harbourfront Centre present the Journey to Black Liberation Symposium. 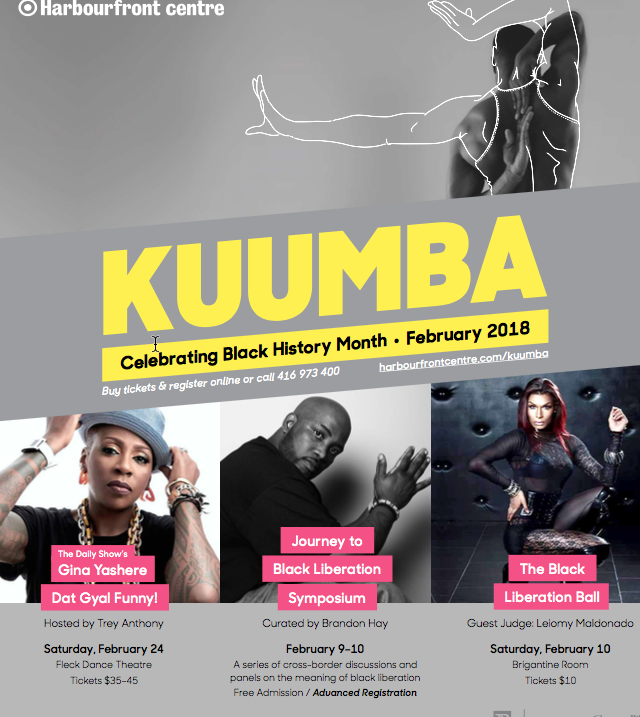 This symposium will take placeFebruary 9th-10th, 2018, in Toronto, Canada, at Harbourfront Centre, as part of its annual Kuumbafestival, Toronto’s longest-running celebration of Black History Month. The Journey to Black Liberation Symposium is a follow-up as learnings from the Black Love Matters 2017 Un-Conference at York University, co-developed by the Black Daddies Club, and an extension of the idea of cross-border conversations and community-building within Black communities globally (Brazil, USA, United Kingdom and Canada) dealing with various forms of oppression that affect our communities. The focus of the JTBL symposium is not to just bear witness to the oppression and injustice, but to also a cross-borders network of Black activists, academics and other stakeholders looking at sharing ideas, strategizing, educating each other and community-building in efforts to achieve Black liberation globally. The two-day symposium will include a mix of plenaries, covering themes from Womanism and HIV addition to Black masculinity and issues around liberation for the Trans Black community. There will also be a photography exhibit, film screening, vogue workshop and a House Ball event. 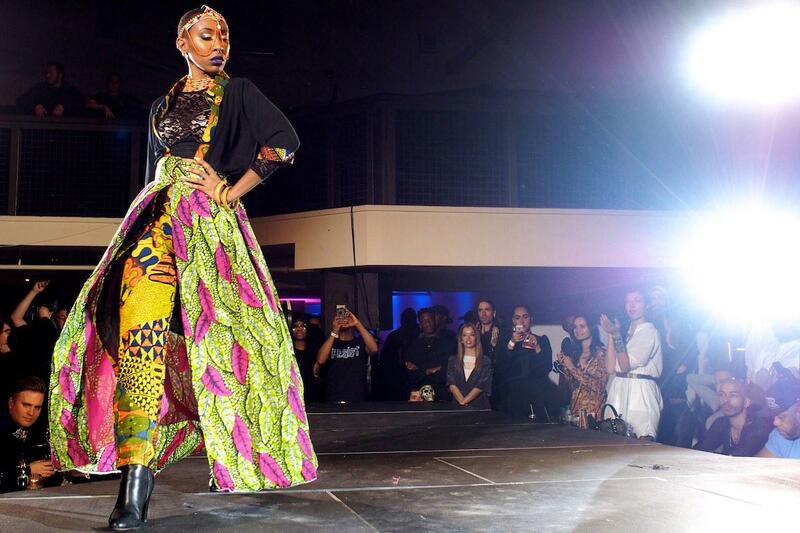 More details about all Kuumba events can be found here. The purpose of having such a mix of entry points into the dialogue around Black Liberation is, as one elder puts it, “When our (Black) communities put on a symposium or conference, we must include the boring pieces (i.e. panel discussions) and fun pieces (i.e. House balls), because of the fact that some people will be interested in the panel discussions and some people will only be interested in attending the House ball, so why not include both pieces so that we can get more people apart of the dialogue?”. With the theme of Journey to Black Liberation, making the symposium accessible was important, so all the plenary discussions are free to the general community. Only The Black Liberation Ball is ticketed, at $10. More details about the plenary discussions can be found here, below is the list of themes. Please note you can pre-register for many events. Come and be apart of the cross borders dialogues around Black Liberation, taking place at the Harbourfront Centre in Toronto, February 9th and 10th, 2018. 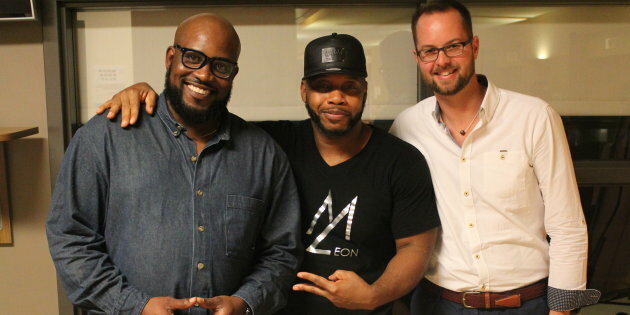 Black Love Matters Unconference course instructor Brandon Hay, left, Michael Roberson Maasai Milan and Shawn Van Shawn Van Sluys of Musagetes at Roberson’s lecture on the house ball community Oct. 24. in Toronto. Blackness, Gender, Work, and Love Symposium will be the closing event of the yearlong initiative called Black Love Matters 2017 Un-Conference. 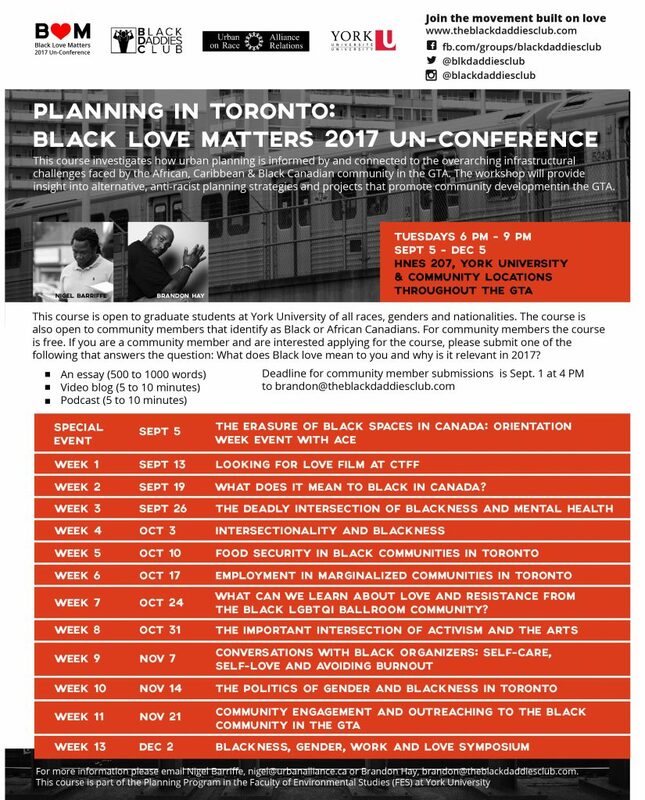 Apart of the Planning in Toronto: Black Love Matters 2017 Un-Conference course at York University, this course investigated how urban planning is informed by and closely related to the overarching, infrastructural challenges faced by the African, Caribbean & Black Canadian community in the GTA. 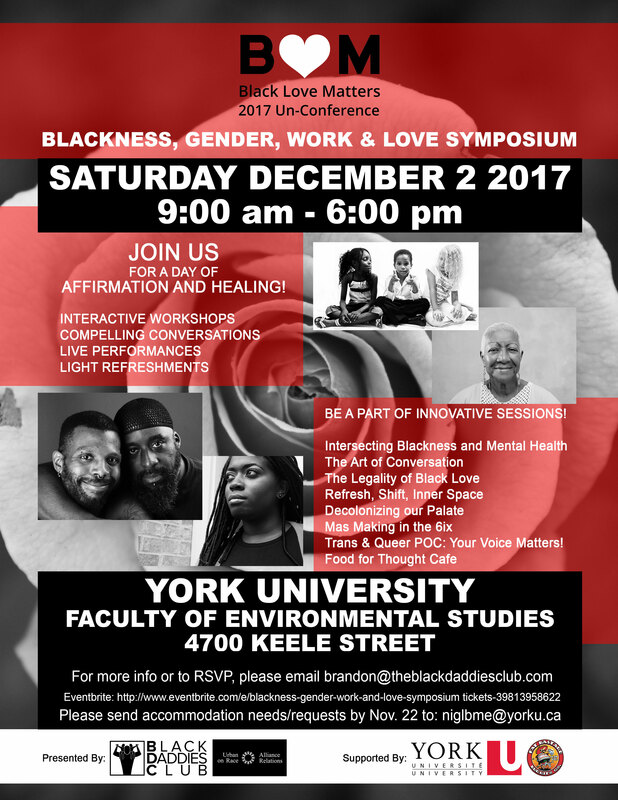 This day long symposium taking place on Saturday, December 2nd, 2017 at Faculty of Environmental Studies at York University, will be co-created by students of the Black Love Matters 2017 Un-Conference course, along with various community stakeholders. The themes of Blackness, Gender, Work and Love will be sewn in throughout the symposium, The students will be responsible of co-creating the plenaries working with community members, community based organizations, government agencies, community based artists and activists to create a plenary apart of the symposium. We look forward to sharing space with you all, December 2nd, 2017 at Faculty of Environmental Studies at York University for the of Blackness, Gender, Work and Love symposium, this will be a free event and lunch will be provided. You can access your free tickets here. I am Super excited to announce that Black Daddies Club and HuffPost Canada, has partnered to make the Black Love Matters 2017 course at York University more accessible to community folks, by broadcasting some our classes on the HuffPost Canada platform. The first class that this will be broadcasting will be Tuesday, October 24th, 2017, The BLM course will explore what the Black community (at large) can learn about love and resilience from the Black LGBTQI2S Ballroom community. Our guest lecturer for this week will be Michael Roberson Maasai Milan (Ultrared), co-creator of the House of Blahnik, Maasai and Garcon based in New York. Michael will be supported by Musagetes for this special discussion in Toronto. Title of Class: “What can we learn about love and Resilience from the Black LGBTQ House ball Community? 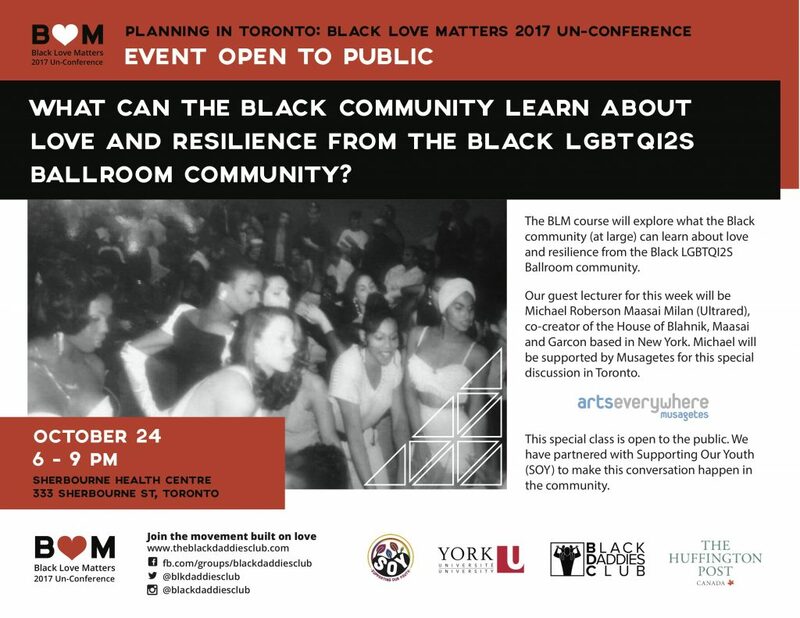 The Planning in Toronto workshop will focus on developing a symposium entitled “Blackness, Gender, Work, and Love” that will be the closing event of the yearlong initiative called Black Love Matters 2017 Un-Conference . This course investigates how urban planning is informed by and closely related to the overarching, infrastructural challenges faced by the African, Caribbean & Black Canadian community in the GTA. The workshop will provide insight into alternative, anti-racist planning strategies and projects that promote community development in the GTA. Students will learn about these strategies and projects, the methodologies around which they were designed and the various challenges that they aim to address. The course will also furnish students with an overview of anti-Black racism in Canada and how it intersects with other forms of discrimination. In addition, students will be introduced to the movements and organizations that seek to respond to the peculiar violence of Canadian-style, anti-Black racism. The students will be responsible of co-creating the Blackness, Love, Work, and Gender Symposium in December 2017; working with community members, community based organizations, government agencies, community based artists and activists to create a plenary apart of the symposium. The Black Love Matters 2017 Un-Conference course is taught by Brandon Hay, MES (Founder, The Black Daddies Club) and Nigel Barriffe, M.Ed. (President, Urban Alliance on Race Relations). We are super excited to announce that the Black Love Matters 2017 Un-Conference course at York University is now open for registration, there has been a lot of love, hard work and collaboration in curating this course over the past 12 months. The Black Daddies Club has partnered with a series of critical thinkers, educators, artists, agencies, institutions and many others to co-create a curriculum that is relevant to the Black and African Canadian community in the Greater Toronto Area, this approach is not a traditional approach by academia standards, however this approach falls into the theory of an Un-Conference. The purpose of the Black Love Matters 2017 Un-Conference course at York University, as I recognize that in many graduate classes there are a handful of Black students, even less with Black men occupying the space, our goal with this course is making education more accessible to the Black community in Toronto and to reimagine the idea of who are the educators and who are the learners, and to also interrogate the idea of what should be considered as knowledge production? The Planning in Toronto workshop will focus on developing a symposium entitled “Blackness, Gender, Work, and Love” that will be the closing event of the year long initiative called Black Love Matters 2017 Un-Conference. This course investigates how urban planning is informed by and closely related to the overarching, infrastructural challenges faced by the African, Caribbean & Black Canadian community in the GTA. The workshop will provide insight into alternative, anti-racist planning strategies and projects that promote community development in the GTA. Students will learn about these strategies and projects, the methodologies around which they were designed and the various challenges that they aim to address. The course will also furnish students with an overview of anti-Black racism in Canada and how it intersects with other forms of discrimination. In addition, students will be introduced to the movements and organizations that seek to respond to the peculiar violence of Canadian-style, anti-Black racism. The students will be responsible of co-creating the Blackness, Gender, Work, and Love Symposium in December 2017; working with community members, community based organizations, government agencies, community based artists and activists to create a plenary apart of the symposium. This course will be held at York University, in the Faculty of Environmental Studies; however, we will also be visiting various locations throughout the Greater Toronto Area throughout the term. This course is open to graduate students at York University of all race, genders and nationality; the course is also open to community members that identify as Black or African Canadians. For community members, the course is free. What does Black love mean to you? And why is it relevant in 2017? Deadline for community member’s submissions is September 1st, 2017 at 4pm. I Hope your summer is going awesome, just want to send you all a quick update regarding some upcoming Black Daddies Club initiatives. 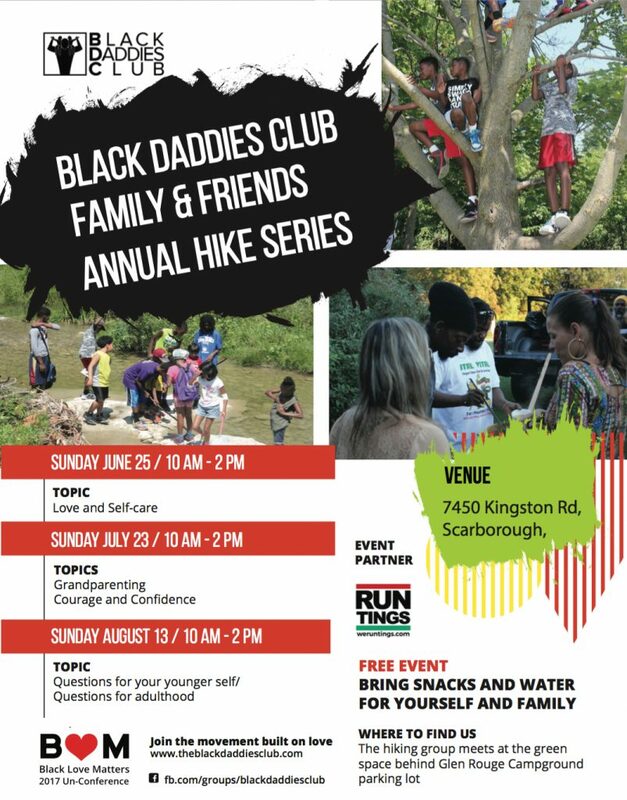 Apart of the Black Daddies Club 10th year anniversary initiative Black Love Matters 2017 Un-Conference, the 2nd installment of the Family and Friends Summer Hikes will be taking place this Sunday, July 23rd at 10am to 2pm at Glen Rouge Camping grounds located at 7450 Kingston Road. The conversation themes for this upcoming hike will be grandparents, elders, courage and confidence. CBC came out to cover our hike in June, you can read more about it here. This 12 week course is open to graduate students at York University of all race, genders and nationality, the course is also open to community members that identify as Black or African Canadians, for community members the course is free. If you are a community member and are interested applying for the course, please submit one of the following that answers the question: What does Black love mean to you and why is it relevant in 2017? * Full course schedule will be a released on our website in a few weeks. This latest documentary of British-Barbadian film legend Menelik Shabaaz discusses what it means to look for love in contemporary society and the difficulties black men and women face in their search. Featuring spoken word artists, therapists, comedians, journalists and activists, alongside real and raw discussions among Black people (young and old), Looking for Love tries to dig to the heart of why love appears to be. You can purchase tickets here. This year marks the 10th anniversary of the Black Daddies Club (BDC). When I started BDC in November 2007, it came from a need in my lived experience as a Black father. Living in Malvern, in the east end of Toronto, I was constantly being told that there weren’t any resources or programming for Black fathers in my neighbourhood. I also recognized that the majority of media outlets in Canada, when speaking about Black fathers, spoke primarily of negative stereotypes, painting the spectrum of Black masculinities with broad strokes, and stigmatizing Black men as “deadbeat dads” who are irresponsible, criminal, dangerous, and un-human. Over the past 10 years, there have been many beautiful people who have supported BDC in a multitude of ways, through sharing their narratives as Black parents in our research projects, or in various documentaries that BDC has co-created with folks in the Black community. We have forged meaningful partnerships that have created fortifying experiences for Black families and community members over the years. Significant is the fact that BDC has never applied for government funding for any of the over one hundred activities produced over the last decade. We have worked with community partners, volunteers and community members to make this work happen. To all the volunteers that have put in their time, sweat, money and love…the folks at BDC wish to convey our profound gratitude. I have learned a lot over the past 10 years, and I am still learning a lot about myself. I earned a Master’s degree by taking my community work into academia and interrogating Black masculinities and Black love. I have made some really dope friendships along this beautiful journey. I have also found, while doing this community work, that it has been difficult to find communities and spaces where I am able to un-mask myself—to take off my armour and be vulnerable—which is such a necessary part of being able to sustain this work. I have gone through depression, and worked multiple odd jobs to sustain the community work that I am doing with BDC. I have been through burnout more times than I can count, and learned that this work requires self-care and self-love. I have met some awesome people and heard many incredible stories. I have found myself feeling hopeful, as well as hopeless, doing this work. I feel hopeful because I have had the opportunity to witness social activism, in response to anti-Black racism, become more mainstream. Groups, such as Black Lives Matters Toronto (BLMTO), are furthering the Black liberation work in Toronto—work started by groups such as the Black Action Defence Committee (BADC). However, my feeling of hopelessness comes from speaking to elders who came to Canada in the 1970s, faced issues of erasure and oppression attending high school, and now have grandchildren facing similar issues in their school system in the Greater Toronto Area (GTA). It makes me wonder, is anti-Black racism declining or increasing, on a systematic and political level, in Canada? For our 10-year anniversary, BDC is celebrating Black love, unapologetically declaring that 2017 is the time for Black folks to love ourselves completely, and more than ever before. As we look at Canadian statistics they show that Black communities are showing up in various Canadian research findings in the areas of criminal justice, unemployment, subsidized housing, children’s aid services, and many more. In an era in Canada where we see police murder Black people and get no jail time; an era where we see that the intersection of mental illness and Blackness can be deadly; in an era where we see racialized and marginalized communities become erased in the name of revitalization and gentrification—from Africville to Regent Park; in an era that teaches Black children to grow up hating themselves or not seeing themselves as human beings. We, as the Black Canadian community, must push back and resist those racist ideologies. We must re-imagine our Black future here in Canada, while recognizing this is stolen land. It is important for us to do the work of collaborating with our Indigenous brothers and sisters, the original caretakers of this land. Apart of the Black Love Matters Un-conference, Black Daddies Club will be hosting a summer series called Black Family Matters, apart of these series will be our yearly summer hikes. The Black Daddies Club summer hikes will be a series of hikes that takes place one sunday a month for the Months of June (25th), July (23rd) and August (13th), 2017. 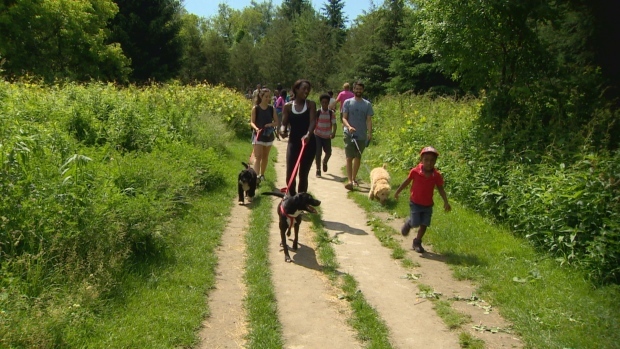 The purpose of these hikes are for Black Families to gather at Glen Rouge conservation park (Scarborough/ Pickering border) Sunday morning’s starting at 10AM to 2pm, and spending the early part of the day, walking and discussing topics as a group. Some of the goals of the hikes is to create community at basic level, but on a deeper level, these hikes are about reconnecting with the land and having our children as well adults reconnect with what it means to learn from nature. The process of the hikes, we gather at 10am at the base camp, near the parking lot. We then form a circle, and speak about the walking agreements of the hikes, such as walking in pairs, not littering, staying clear of poison ivy (staying on the trail), be safe. Each month there will be a topic posed at the beginning at the hikes, and people will speak about these topics during the hikes and at the end of the hike we will speak about the learnings from the hikes, both lessons from the conversations and nature. People have to engage with three different people throughout the duration of these hikes, this promotes the idea of people speaking with new individuals and getting to know knew people. Grandparents did you treat your grandchildren differently than your own children? How important are your parents in your life, how different do you think your life would be if your parents were not in it? These hikes are open to people of all genders, race and religious background, however the premise of these hikes are on the importance of the Black families, Black community at large gathering and claiming space to have dialogue together. With that being said, we also see the importance of other cultures being apart of these walks, so that there can be mutual learning and sharing in the process of these walks.